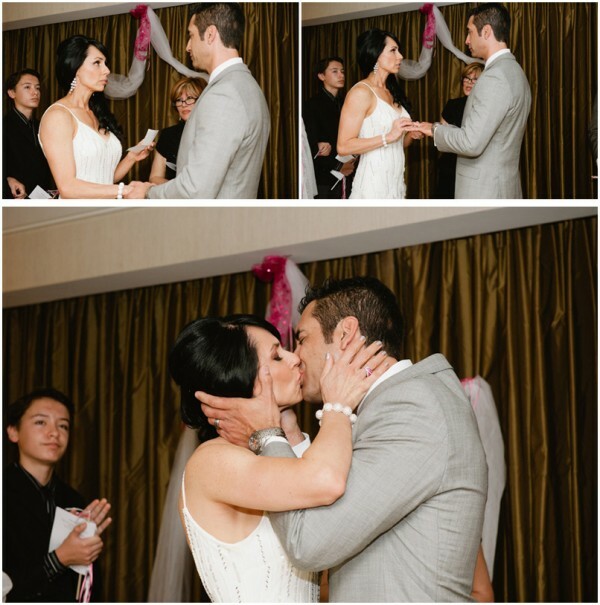 This gorgeous in-suite wedding ceremony and ensuing reception was shot by the always great Mike Lichtenwalner. He had this stunning couple to work with, and what looks like a rowdy party at Burger Bar. That place is tiny and dark – sure can’t tell from the photos though! The party then continued back in the Mandalay Bay Vista suite with custom cocktails and cupcakes. Love it, and the pink Vegas-inspired signage and details. I love the intimacy of the in-suite ceremony. This one was in a Vista suite at M.B. More photos of this hot pink wedding over at Mike’s blog.